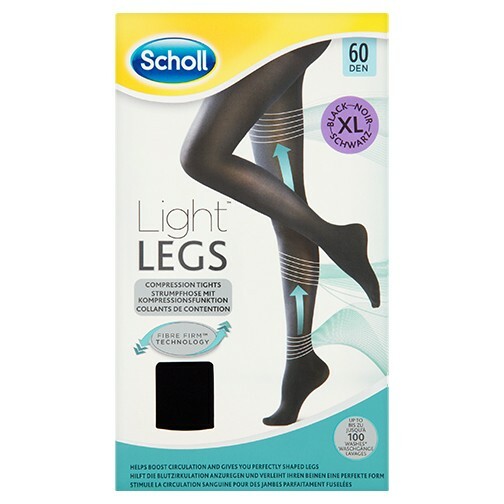 Scholl Light Legs compression tights help to boost leg circulation, preventing legs from becoming tired and achy whilst giving you the perfect shape. Soft, stretchable yarn with FIBRE FIRM technology, these tights are breathable and last up to 100 washes without losing shape and colour. Available in sizes: Small, Medium, Large and Extra Large. 77% Polyamide, 23% Elastane 60 Denier (DN) Appearance, Opaque, Graduated Compression 4 mmHg - 10mmHg, Reinforced Toe.